Don’t waste your time reading this book. Watch Sinek’s TED talk on this instead; it covers everything you need to know. Start with Why is the talk stretched from 18 minutes to 256 pages, and wow, Sinek doesn’t have anything new to add. I don’t entirely blame Sinek for the book’s horribleness. I organize conferences for a living, and in order to break into the speaking circuit — especially if you want that to be your job and you want to get paid for it — having a book is a must for Sinek’s peer group. As a speaker, I’ve been politely told that I couldn’t keynote because I didn’t have a book. Publishing a book’s a smart move for Sinek business-wise, especially to capitalize on his TED talk’s praise. But not all speakers are great writers, and not all writers are great public speakers. And not all great talks can be turned into great books and vice versa. The jury is out on if Sinek’s other books are any good because I have not read them. However, what I did read of Start with Why, I found extremely shallow with a lack of in-depth research into his examples. For instance, Sinek credits the attraction of 200,000+ people to the March on Washington for Jobs and Freedom to Martin Luther King Jr. and his powerful message. Not to discredit any of MLK’s work, nor MLK’s greatest speech delivered there, but he was not the organizer of the March. A. Philip Randolph built the coalition between the different organizers represented there, and Bayard Rustin, an incredible community builder, was the one who put the call out to the people. Rustin’s friends joked that he did this with only notecards in his back pocket and telephone calls in pre-personal computers, pre-internet, and pre-social media days. 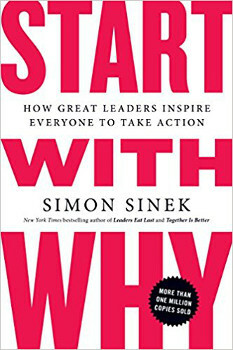 Given how community builders are often swept aside as they put others in the spotlight and how white people have commodified MLK, it’s not shocking Sinek overlooked this work in his retelling and fitting of the March into the Why framework. However, if you go to the Wikipedia page for the March, you can find the organizers’ information in the opening paragraph. This is basic research. Instead of reading this book, spend your time watching Brother Outsider: The Life of Bayard Rustin, which is on YouTube for free. Have you read Sinek’s other books? I’d love to hear if they are any better.